Things having to do with Twilight that are related to the book: fanfic, rpg, products, websites, book clubs, etc. Im Nicole, much better known as Cam on the Lex.., been around since the first thread and as of now still kicking! From the fridged nowhere land known as Canada, petting penguins and such.. (JOKING). And to not be compleatly a nusance I'll anwser some question so the ruler/sledgehammer won't come out..
What instrument do you think Emmett would like to play on? Hmm, I'd say the bass guitar. I play the guitar so I could see us playing together.. then getting bored and doing other things..
Do you think Emmett would watch "The Vampire Diaries?" Yes. I could see him watching it.. and then wanting the power to glamour people.. and then stare at Nina dobrev..
Last edited by cullensallovamybinda on Sun Aug 29, 2010 10:05 pm, edited 1 time in total. Do you think Emmett would watch "The Vampire Diaries"? Oh my god I've missed you!!!!! I even used my smiley quota on you.. It feels so good to see you here!!! I can see him playing the glockenspiel. Seriously. I think if he played the drums they would put the kit out in the woods somewhere so they didnt have to hear him beating on them ALL the time..Which I can see him doing haha. So I better get back to my chemistry study but just gotta show you guys, as Cam reminded me with showing hers, Emmett and I were very busy Saturday before my friends 18th..
Yeah we got a little carried away..
::Elise:: Backhoe Operator for EDC, Inc~EDC's Cheer Squad Captain! Location: Wishing for an Aston Martin. CAM! Oh my gosh, it's been FOREVER~ -Glomphug- Nice wreckage, by the way. It's been a while since I saw one of those around here. And Elise, too! Holy crow, I'm glad that building was vacant. Yes, yes he would, if only to laugh at it. They make a lot of Twilight jokes themselves, actually! So I think he would be amused by it and all of the differences between the two types of vampires. And in my dream world, we would all be having a Vampire Diaries marathon and I would bring the popcorn for the humans and Emmett would make fun of all the annoying characters like Uncle John, and we'd be laughing so hard that our ribs hurt. It. Would be. Awesome. I lovelovelove that show. 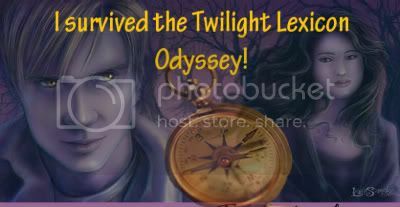 Hahah xD I don't really see the Twilight similarities, but I guess that might be because I knew The Vampire Diaries came out before Twilight when I started watching it? Not sure. o: I like 'em both either way. Obviously. GLOCKENSPIEL! That made me laugh SO much IRL. Elise, what a way to go! Okay, I got a question that will sounds WEIRD, but it just popped into my head so bear with me ya'll! If Emmett could decide between human with Rose, but unable to bear children or Vampire, what do you think he would choose? BRI! I HAVENT HEARD FROM OU IN FOREVER! What's been going on with you! and hello jen Hows you been doing! RahRahRah, you know what guys? QUESTION TIME !!!! Well for me this is an easy question.. the only reason Rose wants to be human again is to grow old with Emmett have kids and lots of grandchildren. Here is the problem though, since hypothetically they can't have children together it is actually pretty dumb. Yeah, sure maybe a millennium from now when they feel they no longer want to be on this earth they could become humans and die naturally . But if they choose that now, they would only have maybe 60 years together Max before they both passed away. and that isn't including murder or accidental death. 60 years to a vampire isn't long at all. with the fragile human nature they wouldn't be used to what we live through. they will see through our eyes live through are human functions. really it is like a HUGE down grade for no real payment but being able to die naturally. Hell, i think rose is only like 75 years old anyway! so I don't think he would choose to be human with Rose if they couldn't have children together.. but after all, I am pretty sure that is rose wanted to be human Emmet would follow her either way. and I told some birdies I would ask a question soo.. If Emmett could have changed his entire look in the 40's, 50's, 60's, 70's, 80's, 90's, or today. What style do you think he would choose? and if there hard to explain, FIND PICTURES!! Nice. Very nice. I wish you guys could feel what it is like to crush buildings with your bare hands. There is nothin' like it. Of course, Esme gets a little miffed, but she gets over it. She's like putty in my hands when I give her my "little boy" pout. Why should the devil have all the good times? Location: Home is where the heart is. The Real Emmett Cullen wrote: I wish you guys could feel what it is like to crush buildings with your bare hands. There is nothin' like it. Of course, Esme gets a little miffed, but she gets over it. She's like putty in my hands when I give her my "little boy" pout. Emmett, do not mislead these nice people. Your "little boy" pout does not turn me into putty, but I do love you. By the way, why are you playing here when you should be moving those boulders so I can repair the house? Demolition, I may add, that you caused when you were horsing around with the boys. I am beginning to think with Jacob spending so much time with us, I should build him his own space. Emmett I may need you to assist me with the addition to the house, if you would be so kind. Do you think your crew would like to help? Earning sainthood by raising five teenagers for eternity. EMMETT, ESME! Its soo good to see you here! its been to long..
Emmett we love our demos with you.. even though you do all of the wrecking And Edward, Jasper, Jake and yourself should calm down fight in the forest ! Esme! I would love to help build an addition to the Cullen home! and I am sure the whole crew would love to also! just tell us where and when! well thats all for now! 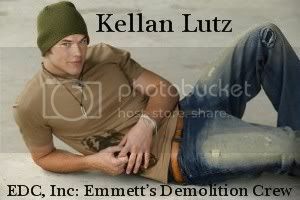 cullensallovamybinda wrote: If Emmett could have changed his entire look in the 40's, 50's, 60's, 70's, 80's, 90's, or today. What style do you think he would choose? and if there hard to explain, FIND PICTURES!! Do you mean what he would choose now out of all of them or what look in each decade? I'm confused! Emmett-So nice to see you! Glad you stopped by And I think she deals with it quite well, as she knows that you love to destroy things But as a mother myself, I think I would be a tad upset if things got destroyed like that by my child! At least you can help fix it! Esme-Glad to see you as well! And good for you to get him like that! and sounds like a great idea to add on!